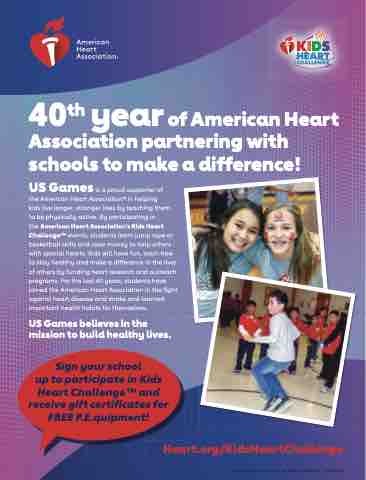 40th year of American Heart Association partnering with schools to make a difference! the American Heart Association’s Kids Heart ChallengeTM events, students learn jump rope or basketball skills and raise money to help others with special hearts. Kids will have fun, learn how to stay healthy and make a difference in the lives of others by funding heart research and outreach programs. For the last 40 years, students have joined the American Heart Association in the fight against heart disease and stroke and learned important health habits for themselves. US Games believes in the mission to build healthy lives. up to participate in Kids Heart ChallengeTM and receive gift certificates for FREE P.E.quipment!